Do you already own a new iPhone? Then this article isn’t for you. Are you in the market for a new smartphone? Then you’ve come to the right place. In September 2014, Apple introduced two new iPhones, the iPhone 6 and iPhone 6 Plus. They joined the iPhone 5s and iPhone 5c, which remain on the market. Which iPhone should you buy? It’s time to take a look at the differences between each of the current iPhone models. 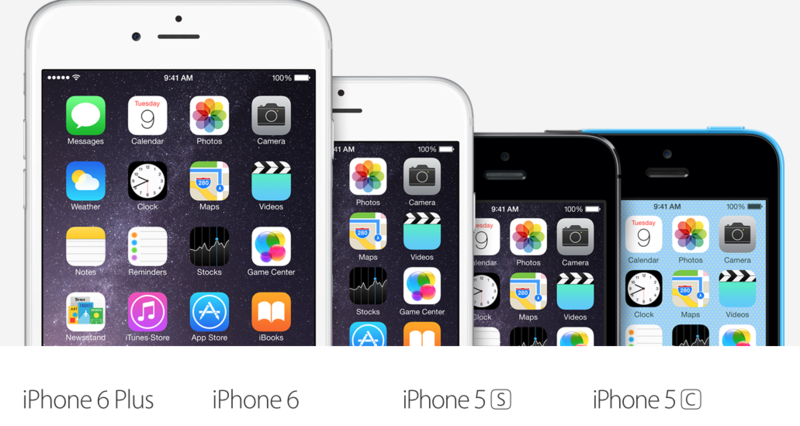 The 2014 iPhone models are essentially the same except for two main differences — screen size and camera capabilities. Both phones feature an A8 processor and M8 motion coprocessor, which Apple claims offers 25 percent more CPU performance and 50 percent more graphics performance, while drawing only 50 percent of the power, versus its predecessor’s A7 and M7 motion coprocessors. The iPhone 6 and iPhone 6 Plus feature the biggest displays ever developed by Apple for a handset device. The iPhone 6 includes a 4.7-inch Retina HD display with a 1,334 by 750-pixel resolution at 326 ppi. The Retina HD display on the iPhone 6 Plus measures 5.5-inches diagonally with a 1,920 by 1,080-pixel resolution at 401 ppi. 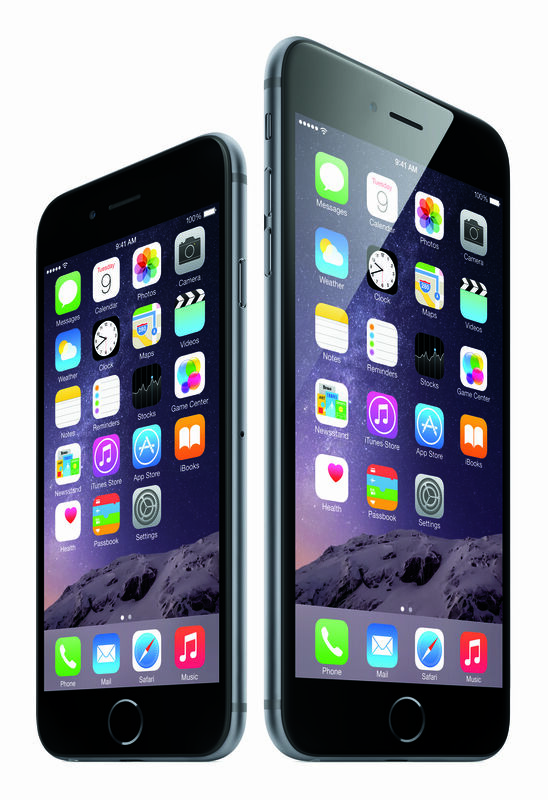 The iPhone 6 weighs 129 grams, while the iPhone 6 Plus is 172 grams. Each is available in silver, gold, and space gray, with 16GB, 64GB, or 128GB of storage space. In the U.S., the iPhone 6 is priced at $199 (16GB), $299 (64GB), or $399 (128GB) with a two-year carrier contract. The iPhone 6 costs $649, $749, and $849 without a contract. The iPhone 6 Plus is priced at $299 (16GB), $399 (64GB), or $499 (128GB) with a two-year carrier contract. The iPhone 6 Plus costs $749, $849, and $949 without a contract. SquareTrade determined that both the iPhone 6 and iPhone 6 Plus performed “impressively” in breakability testing, and each carries the top breakability score in their respective category. The SquareTrade breakability score ranks today’s top devices based on how prone they are to break due to accidents. Evaluating key elements such as front and back panel design, edge construction and materials, size, weight, friction quotient, water resistance and grip-ability, SquareTrade’s breakability score fills in the missing gap left by traditional device reviews: it tests devices in everyday danger situations brought on by our lifestyles and habits. The screens on both new iPhones held up very well to breakability testing, giving credence to Apple’s promise of ion-strengthened glass. In addition to the features mentioned above, the iPhone 6 and iPhone 6 Plus each come with Touch ID, Apple’s fingerprint identity sensor built into the Home button, and Apple Pay, the company’s new mobile payment service. Both phones run iOS 8 and later, and come with an 8-megapixel iSight camera with 1.5µ pixels, and a 1.2-megapixel FaceTime camera. The iSight camera on the iPhone 6 Plus features optical image stabilization, which stabilizes the recorded image by varying the optical path to the sensor. Soon after the iPhone 6 Plus was introduced, some users claimed that it was easy to bend. Apple quickly responded to the issue with an official statement saying that only nine customers had contacted them with bent iPhone 6 Plus units and that the handsets had been subjected to rigorous tests. Consumer Reports ran its own tests and found that Apple’s phones were “pretty tough.” In particular, the iPhone 6 Plus was tougher than the iPhone 6: the 5.5-inch model started to deform at 90 pounds of applied force and came apart at 110 pounds, while the 4.7-inch model did so at 70 and 100 pounds, respectively. The iPhone 5s was announced in September 2013. At its launch, the model was available with 16GB, 32GB, and 64GB of storage space. In September 2014, the 64GB model was discontinued. 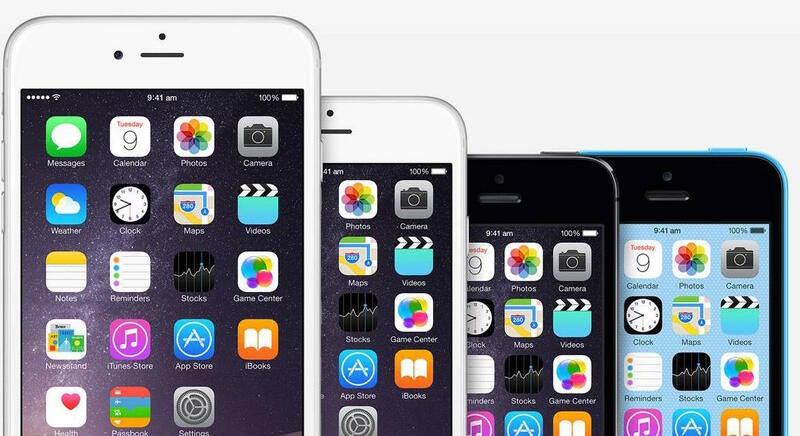 Like the iPhone 5 and iPhone 5c, the iPhone 5s features a 4-inch Retina display. It comes with an A7 processor and M7 co-processor. Apple says that this combination is up to twice as fast and has up to twice the graphics power compared to its predecessor, the Apple A6. 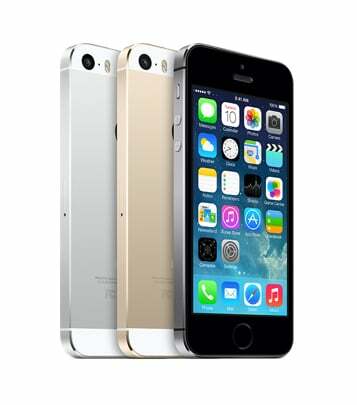 The iPhone 5s weighs 112 grams, and is available in silver, gold, and space gray. This is the lightest iPhone on the market. The iPhone 5s is priced at $99 (16GB) and $149 (32GB) with a two-year carrier contract. The iPhone 5s costs $549 and $599 without a contract. In 2013, SquareTrade put an iPhone 5s through three drop tests designed to simulate device danger situations in the home environment. It found neither the iPhone 5s or iPhone 5c were as durable as the iPhone 5, which launched a year earlier. The iPhone 5s was the first Apple device to include Touch ID. It was also the first to come with a co-processor. The gold iPhone 5s was in short supply at the beginning of its product release schedule. Because of this, some Chinese entrepreneurs attempted to cash in on the popularity for Apple’s difficult to find handset by offering a less expensive solution. Impatient customers could transform their existing iPhone into the popular gold variety. To do so, they simply needed to purchase a $2 “golden sticker,” according to The Wall Street Journal. Launched alongside the iPhone 5s in September 2013, the 4-inch iPhone 5c was Apple’s first attempt at making a mid-priced handset. At launch, it was initially available for as little as $99 with a new two-year contract. Originally offered in 16GB and 32GB varieties, the plastic-bodied iPhone 5c remains available with 8GB of storage space. It is available in blue, green, pink, yellow, and white, and weighs 132 grams. Though released at the same time as the iPhone 5s, the iPhone 5c actually features internals from a year earlier. In other words, the iPhone 5c is really the iPhone 5, except with a plastic cover. On contract, the 8GB iPhone 5c is free upfront. You can buy it without a contract for $450. 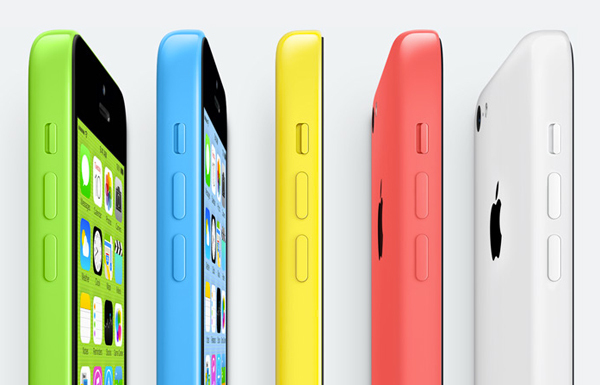 The iPhone 5c is all about color … and little else. It features technology first developed nearly three years ago. Most initially expected that Apple would add new color choices for the iPhone 5c. Poor sales numbers ended this possibility. Apple currently sells four iPhones: the 4-inch iPhone 5s and iPhone 5c, the 4.7-inch iPhone 6, and the 5.5-inch iPhone 6 Plus. Features and prices differ for each. Not surprisingly, the newer the device, the better the features and the higher the price.